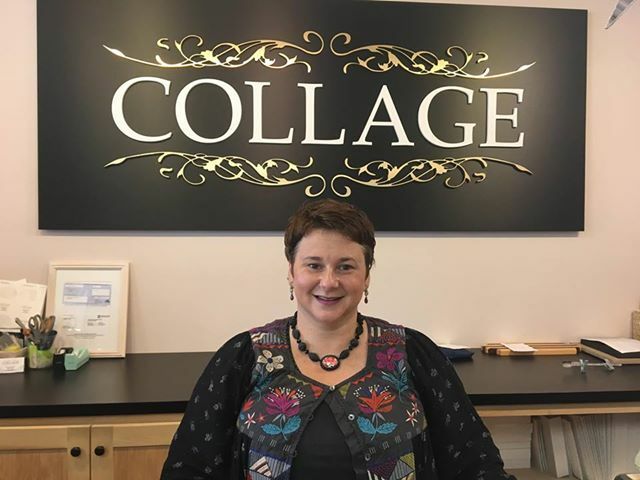 Bob Phibbs interviewed Whitney Morgan, Owner of Collage in York, Pennsylvania who just received the Retailer Excellence Award For Socially Responsible Retailer. She shares her ideas that you can always purchase more so feel free to wait, retail is a lot of time spent figuring things out and being socially responsible is the best way to show your community support. • You can always purchase more, don't buy all at once. • Retail is a game of figuring things out. Whitney: All right. So my name is Whitney Morgan. I own a store in York, Pennsylvania called Collage. I bought my business about nine years ago, it's a gift store. The store itself has been here since 1983. So it is a staple in York community. I'm a fourth generation retailer. I've been part of independent retailing since I was born, so it's kind of in my blood. And basically, you know, I've been following your podcast, listening to your advice and, you know, just keeping up with modern day retail. Bob: Good. But you have a big thing that happened recently. What happened the other night? Bob: So what does that mean? Whitney: That means that over the past seven years, we've actually been working with a local women's shelter for domestic violence. And we've been renovating their rooms at the shelter. And we were recognized for all of our hard work on Sunday night. Whitney: Yeah, it's been an awesome experience and one that I never thought I'd actually win an award for, because it's just a work of passion. Whitney: Well, my family owned many stores back in the 1980s and 90s, some department stores. And when big box stores came into town, unfortunately, our store went bankrupt. And we kept one store open, which was health and beauty aid store. And I went to college and studied fine art and realized that I couldn't do much with my degree, so I went to work for my dad. And I actually learned his business from the ground up. I started like in the warehouse just entering in...you know, doing data entry work and ended up being a buyer by the time we sold it I guess, in the early 2000s. So I went to advertising after that and I realized I was walking into a lot of retailers when I was selling advertising. And every time I'd walk in, I'd, you know, wanna be adjusting their shelves. And I felt like a fish out of water, doing what I was doing, and I just really missed retail. So I ended up walking into a beautiful boutique one day and I kept saying, like, if I ever had a store, this is what it would be like. And the woman that owned it was getting ready to retire so I ended up buying it. Bob: Well, that's great. That's the best way, I think, to really get into retail because it sounds like when you touch all those elements, I think you see all the touch points for the customer. And it's everything from data entry to the marketing of it, to knowing your numbers as a buyer, for example. I mean, I think that's what I struggle with when I read about gift stores and some of the things they talk about why it's tough and it's like, well, do you know your numbers? You can't just buy what you like, right? Bob: So what's he yelling at you? Whitney: He's yelling at me to think about paying my bills and how we're gonna do that and not to overbuy and you can always, you know, you can always purchase but you can't go back and try and make up, you know, bills. Bob: I love that. You can always purchase, that's what people forget. Like, there's this window I have two days I'm at the show. This is the only time I'll ever be able to buy anything, I better buy it now. It's not like that. Whitney: And when I started going to the shows I actually, I did that. I would buy like, you know, thousands and thousands of dollars worth of merchandise. And then I'd get home and, you know, when it would all come in I'd be like, "What did I just do?" And so now when I go to the shows, I do a lot of, you know, just looking and then I'll come back and really evaluate things and then do my purchasing. Bob: Cool, I like that. I like that. And [inaudible 00:05:20] challenged in the last four years and how did you overcome it? Whitney: Definitely the economy. I feel like where I am and probably a lot of your customers are, you know, the economy just isn't...like, when I first bought my business in 2009, things were going great, and then all of a sudden it tanked. And it's just, we still haven't come back from that. So I've had to really think about...first of all, think about what I'm buying and make sure that it's just not like gonna be dead weight in my store. And also price point, making sure that I have, you know, multiple price points for everybody, you know, who walks in the store. And also just keeping things really unique and customer service has to be like top notch so that people, you know, still think of you as a specialty shop and, you know, you don't turn into a store that you just walk into and nobody talks to you. Bob: Right. Or just have a museum. You have so many pretty items. I just love coming to your store. Yeah, well, that's not why you're here, buy something, okay? Whitney: Exactly yeah, yeah. So, you know, those are some of the things I honestly, you know, still struggle day to day. You know, you're constantly worrying about next season or, you know, even tomorrow. But, you know, I just feel like even doing the work that we did with the shelter, has definitely put our name out in the community and it shows that we're supporting our community who supports us. And I have customers coming in all day long, dropping off donations for them. So it gets people in the door, whether they're coming to shop, you know, they're still walking through my door. Bob: Well, I think it's so important that... You raise a really good point because I think so many times people come up to us and say, "Can you give me a gift certificate for our...something, something." And the people will say, "Oh, we support the community." That's not supporting the community. Supporting the community is actually just doing it because that's who you are and if someone notices it, then that's great. But it's kind of baked into your DNA. So tell me more about how you got started being socially responsible and any tips you could make for somebody looking to do it. How do you decide on it and what...you know, any things you can add. Whitney: Yeah, like focus on...you know, do a contribution or if your organization is interested in helping us, you know. That's actually gotten me some really nice donations for the shelter. Whitney: Well, and this is kind of what I was telling the audience the other night, when I bought my store...and this is how I started my speech, I knew that, you know, my store would sell really beautiful things. But what I didn't know and hopefully other store owners see this within their stores is, like how much beauty actually does go on in your store. In my store for example, I have a gift shop, people are always like, buying gifts for each other and putting a lot of thought into things. And for the most part, I knew that my customers would...they want to help organizations but they don't really know how. And they don't wanna just write a check. Sometimes they just, you know, at home they may find some clothing that they want to, you know, donate. And so I've made it available to them to drop off things all the time. But this shelter was... About six or seven years ago, somebody had come in and asked me if I had heard of them and they're only, you know, blocks from my store. And I said no, and I said, maybe I'll go down and take a tour sometime. And when I went down there, it was just like, in shambles, like the building was barely like, it looked like it had never been touched. And so...it's an emergency shelter for families, you know, fleeing from really violent situations. So, you know, I was seeing like, all these kind of materialistic things going on in my store and then I saw like, a couple doors away like these people really struggling. So I just started asking my customers to bring in, you know, bags of gently used clothing, toiletries, you know, things for the home that would be, you know, utilized at the shelter, bedding, and that kind of thing. And they started bringing like, every week I'd have two carloads, three carloads of things that people had dropped off. So as I started going more and more to the shelter, I was able to see the different rooms and everything and I thought, you know, what I'll do is I'll take some of my staff and their kids down and we can maybe repaint some rooms or something over the summer. And it's kind of turned into something that we do annually every summer. And this year I had 30 kids help me paint three rooms and an office down there. And, you know, it just gives these dark and dingy rooms like a fresh look and, you know, it brings up their morale definitely [inaudible 00:11:50]. Whitney: It makes us feel good. And the communities really helped me, I was able to raise money to build a playground for them. So, you know, we've just taken this organization and kind of run with it. Bob: Well, I love that. And how do you balance that with being an entrepreneur? Because on one side, I could see somebody listening to this like, "Oh, this sounds great, but my God, people are dropping off stuff every day. And how do I sell my merchandise? And then how do I...? Whitney: I mean, I have people that do that too. But I will tell you that it does...people, you know, are constantly talking about our store because they'll, you know, they'll say, "Oh, you know, Collage did this for, you know, Access York and/or if you're cleaning out your closet, you can just drop that off at Collage." And, you know, so it is advertising too for us which, I mean you want to have people talking about you and it's a very positive thing that, you know, we're doing in the community. And I've had such people, you know, over the last few days after they heard about my award, you know, like, an influx of customers have been like walking through the door. You know, they wanna support you because they know that you're doing something really good. Bob: Well, I think that's the key that you are able... One, they're able to see what you're able to do, two, you've made it easy for them to contribute, and then three, it brings out the best of why retail exists, I think, which is making a difference in other people's lives through a variety of ways, right? Bob: Well, you definitely knew that you should do that. So there you go. See, that's this that other side of you. Bob: What would you tell a friend that says to you, "Let's go out for coffee?" And you're like, "Okay, that's great." And they tell you "I'm thinking of opening up my own retail store." What would you tell them? Whitney: Pretty much I would say, "Don't do it." I was very fortunate because I grew up in retail. And before I bought my business, my dad pretty much sat me down in his accountant's office and screamed at me. And, you know, really, you know, wanted me to realize how stressful retail can be, you know. Bob: Well, it's precarious. I appreciate that though. He's telling you like, you're driving a sports car at 80 miles an hour here, things can go off the rails pretty easily if you take your eye off the ball, right? It's that kind of thing. Whitney: Exactly, yes. Second of all, you know, I have this genetic thing in my blood that I just can't get out of it. So for me, I felt like it was a whole different ballgame. When I hear people that want to go into it, I really encourage them to work in retail for a long time because you get to know... I mean, we're just not selling pretty things all day. It's a lot of work. It's a lot of box opening. It's a lot of, you know, blood, sweat, tears, and staying up all night trying to figure things out. And I don't think a lot of people understand that. I also feel like, my business was in a great location, it had a following already. So that to me was really important. If I were just starting over again, I don't believe I'd open up in the same area that I'm in because it's a struggling economy. I would probably, you know, move it to maybe another town. But I am very honest with people when they talk about opening up stores because I see a lot of stores open and close within like five years. Bob: Yeah, well, even much quicker, like restaurants, you know. You know, people would look at you after a few months so, like, "When do I start pulling money out?" And you're like, "Well, it's not gonna happen in the first few months because you bought all that money." That money is sitting in your store. That's, I guess, what I always go back to is, it's always fun to buy. It's always fun to buy. Especially when it's not even your real money, it's kind of like, "Well, we're buying it for the store." But when it all arrives and you're now looking at it, and to your point earlier, what do I do with all of this? That's not fun. So I think that's good. I think that realistic, go out there and work at another retail store and see all of both sides of it. And there are some of us that working in retail is always great. I mean, I'm fortunate, I love to be in a store, I love the whole atmosphere, and I love the temporariness of all of it and then the long term relationships I build as well. When you feel overwhelmed or you've lost your focus, what do you do to rebuild yourself Whitney? Whitney: I think that I do try to take some time, maybe like a day or two off just in... I usually find myself in other retail stores just trying to get ideas. I, you know, like to go to other towns to look around and just see, you know, merchandising ideas. That's also important when you're opening up a store to make sure that your product is merchandised properly. But I think the shows always come around at like the perfect times because I feel like I'm just starting to get burned out before I go to the next show. And that kind of like, you know, gives me a little bit more energy when I walk through the doors and see new product and, you know, new seasons. Bob: Well, you feel hopeful. That's just like your customer feels when they walk into your store after you re-merchandised it, right? It's that same feeling. Bob: Nice. Well, tell me something good about retail. Whitney: I think that some of the great things about retail are the...especially being an independent retailer, that you can constantly reinvent yourself. You're always evolving. I've gotten to know amazing people through retail. I feel like I'm much more connected to my community and knowing what's going on in the community through my store. You know, I love the different seasons that, you know, you go into. So those are some of my favorite things. Bob: Nice. And that's great. If you were to think about like...it's funny, you go around to other stores and that's my occupational hazard when I go outside Mexico City. I go looking at other stores and I find myself in the malls like, "What the hell are you doing here? Let's get outside and do some yells." But it's enervating to me because I do try to look at, why are you doing this and how do you do it? What's your definition of like a great customer service experience? What has to happen for it to be excellent in your mind? Bob: Well, that's exactly it. Bob: That's a great point because people forget the pass off is the last chance you have to wow me. And even if the visit wasn't necessarily great, you can kick it overdrive by looking at my credit card and saying me by name and coming around the counter to help me with the purchase or walk out with me if it's raining, so I don't get the gift wet, or a million things. But that's where, I think, so many smaller retailers in particular tend to kind of give up, "Oh, I got the sale." It's like, no, no. Whitney: Yeah, I actually had... I mean I'm being honest here, I corrected one of my employees because, you know, even handing somebody the bag correctly is, you know, important. It's from start to finish. And I tell my girls every customer should leave our store with a smile, you know. Bob: That's great. And that means you have to make sure that they have it, not tell them a joke or something. Bob: Well, good. Well, tell me, how do we find out more about you? How do we find out more about Collage? Whitney: We are on Facebook at Collage Shop. Our website is collageofyork.com. And on Instagram, we are Collage of York. Bob: Wonderful. Well, it's been a pleasure chatting with you today. Whitney: Thank you so much.